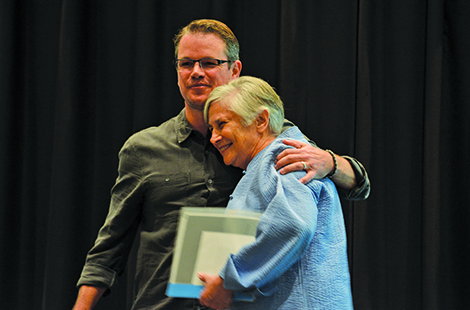 Actor and Academy Award-winning screenwriter Matt Damon introduced Diane Ravitch, the former U.S. Assistant Secretary of Education, at a lecture hosted by CSUN’s Center for Teaching and Learning. Read more about the lecture. Conducted at CSUN, the study will focus on the student-athlete experience in three main areas: campus engagement, athletics and academic success for women and students of color. Read more about the study. The new facility will allow Tseng College to expand CSUN’s strong presence in graduate, international and midcareer education, as well as in applied research and research relationships with regional, national and international employers. Read more about the new building. Thu., Nov. 7, 7:30 p.m.
Fri., Nov. 8, 7:05 p.m.
CSUN officially opened the doors to a new era at the Delmar T. Oviatt Library with a ribbon cutting ceremony. Ashlee Guay, CSUN’s women’s basketball point guard, was named to the Big West preseason all-conference team. Meet Francis Gary Powers Jr., son of the famed pilot and founder of The Cold War Museum, who will introduce the exhibit “The U-2 Incident – Cold War Crisis” at the Palm Springs Air Museum.